Recent graduate Kelly Contreras (from left), McKayla Schmidt (B.B.A. 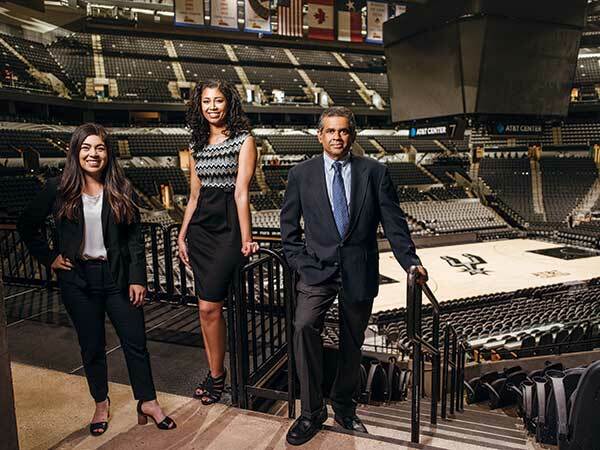 ’13) and Professor of Marketing Mathew Joseph, Ph.D., inside the AT&T Center arena. One by one, students introduce themselves to a room full of senior executives from Spurs Sports & Entertainment (SS&E). This is how St. Mary’s University students begin their journey in the Sports Marketing course offered by the Greehey School of Business. In Spring 2017, Kelly Contreras (B.B.A. ’18), then a senior Finance and Risk Management major, was one of those students. She never imagined that soon she’d be interning at the AT&T Center — home to the NBA’s Spurs, AHL’s Rampage and the San Antonio Stock Show & Rodeo. SS&E also runs the NBA G League’s Austin Spurs and the United Soccer League’s San Antonio FC. For the past five years, Mathew Joseph, Ph.D., Emil C.E. Jurica Distinguished Professor of Marketing, has taught the course. Students who have a passion for the sports industry are assigned projects within the SS&E organization and matched up with executives for mentoring. SS&E gives back to the community by meeting with local universities to share their experiences and help students build their skillsets. The partnership with St. Mary’s has thrived thanks to former students like McKayla Schmidt (B.B.A. ’13), who now serves as the liaison between SS&E and St. Mary’s. Leave it to the Spurs to turn promising rookies into seasoned professionals.